Tara (formerly known as Organic Sister) has so kindly given me this sparkly Valentiney sort of lovey award. While I suspect that she may have simply run out of people to give it to :) (I went and peaked at where she got hers, and some of my favorites were on that list) I none-the-less will accept her lovey award with much appreciation! I get to pass it on to ten people - and I am choosing folks that I think are really really great (and important!) at sharing love - and in my opinion making the world a better place. Sheri at My So-Called Homeschool. Because she is gentle and inspires others to look for it within themselves. M (oops, I almost typed her name!) at Stuff About the Duffs. Because she is spreading thickly love and gentleness in her new (again) home state - and I think she'll be winning over the entire state of Texas in no time. Sarah. Because I'd like to pass on some loves to her, too. My sister KimK. Because I love her. LOL I swear that's not why I picked you. I actually read your blog faithfully in my reader and always enjoy seeing your great relationship with your kids. You truly got the award cuz you truly deserve it! LZ- You are certainly welcome. M - You're welcome also. And I look forward to it! Tara - :), aw, thanks so much. I was going to take it anyway, mind you... but I'm glad you you didn't pull my name out of a hat! 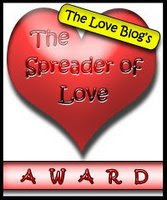 Great to see my love award is spreading. I never thought it would catch on so greatly when I created it to Spread the Love.